Quinn is the present-day incarnation of an ancient soul, cursed with the memory of his numberless past lives. He is the envoy of an ancient civilization in search of the love and soulmate he lost thousands of years ago. 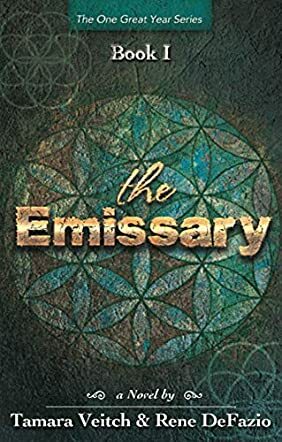 The Emissary by Tamara Veitch and Rene DeFazio chronicles his early life in an idyllic city prior to the Great Year turmoil, a cataclysmic planetary event which occurs every 26,000 years. In this original life he is called Marcus - he has two close friends, Helghul, a boisterous, ambitious young man and Theron, the daughter of the city’s spiritual leader. The love that develops between Marcus and Theron breaks up the friendship, and a jealous Helghul is enticed by dark forces to embrace their nefarious plans for the future of mankind. After the turn of the Great Year and the destruction of the trio’s society, we follow Marcus through a number of incarnations where, as an emissary, he is tasked with promoting knowledge, peace and harmony, while searching for his lost love. His efforts are hampered by his former friend, but now sworn enemy, Helghul, who pursues a very different agenda. Which line will the new civilization of planet Earth follow? Can Marcus /Quinn prevail over the dark forces that have seized control over his former friend? Will he ever be reunited with his lost love Theron? The basic tenet of The Emissary is the concept that our sun is part of a binary system with the two suns reaching a nexus every 26,000 years. At this time a great change will take place on our planet and some believe a new Dark Age will commence. Tamara Veitch and Rene DeFazio have produced a compelling narrative, full of intriguing concepts and insights, which moves at a brisk pace through a lucidly-imagined history. The ambitious theme is peopled with rounded, believable characters and pulls no punches in its descriptions of turbulent times. I enjoyed the story and was prompted by the list of references at the end to look further into the concept of the Great Year. I hope the authors will accept this as a compliment to their narrative skill. Well-written and researched - a sound, thought-provoking start to what I predict will be a successful series. The Emissary is a work of fantasy fiction penned by co-authors Tamara Veitch and Rene DeFazio, and forms the first book of The One Great Year Series. In this opening novel, we focus on the ongoing theme of rebirth and reincarnation with a pair of lovers and soulmates, Marcus and Theron. Marcus is reborn with all the memories of their past lives together, and he pursues Theron through thousands of years within the cycle of the One Great Year. Sometimes the pair can rekindle their connection, and sometimes they don’t remember one another at all. Worse than this, they’re not the only ones who are able to remember, and the dark figure of Helghul is always on hand to try to hunt them down. Written for adults due to its graphic content, the text of The Emissary flows like a biblical story, full of shifting generations through thousands of years of storytelling. It is really enjoyable that each generation and each story is actually presented by the same characters in their various rebirths, which gives some cohesion to a complex plot. The good versus evil and light versus dark motifs are at play, with epic enemies in the mould of classical figures, once again contributing to that legendary and mythological feel. Co-authors Tamara Veitch and Rene DeFazio write with vivid description and a strong backstory of the lore of the world they have created, which develops overall into an epic and unbreakable love story set against the potential destruction of Earth. The Emissary is a recommended read for fantasy fans. Atitalan Emissaries had been sent to guide humankind in evolution. They had been selected to leave their land, to die and be reborn for the span of a Great Year Cycle. They were to guide humankind, but they should not have been aware of their identity, their mission. But Quinn was, he remembered his time as Marcus, just as he remembered each of his past lives. He also remembered his soulmate, Theron, and sought to find her so they could once more be reunited. Just as there were those sent to guide the world into a new golden age, so too were those whose skills and purposes were turned to darker purposes. All things in balance, and yet the scale still seemed unequal. Marcus' childhood friend moves against the Emissaries. He too possesses past life memories and the darker force aiding him will stop at nothing to quash the emissaries and their attempts to guide fate. The Emissary is the start of Tamara Veitch and Rene DeFazio's The One Great Year Series. It acts as a foundation, allowing the reader to be drawn into the present day situation before reliving parts of the past which brought the main character, Marcus aka Quinn, to the point where he now finds himself. This book sets a great background and starting point for what could be a gripping series. Clear attention has been paid to detail, characters, personalities, and rivalry. There are some good ideas which can be viewed as both historical and futuristic, and some interesting play on myths and legends. I enjoyed the steady pace and rising tension as the understanding of what is to come becomes clearer. Alternative history meets low/urban fantasy to create a battle of light versus darkness that spans the reaches of time. The Emissary (The One Great Year Series Book 1) by Tamara Veitch and Rene DeFazio is a tale of fantasy and time. Marcus and Theron; two lovers, one rock-solid bond. Their world, their lives have been shaken by one catastrophe after another and both have been selected to become Emissaries. Their destiny is to take the human race into peace through 13,000 years. But there is one man determined to destroy Marcus and Theron. Helghul, evil personified, pursues them across time, battling to ruin the world and end all hope for salvation. Follow Marcus on his epic journey as he reaches the present day and faces the biggest battle of his life – saving Atitala and their life-giving secrets. The Emissary by Tamara Veitch and Rene DeFazio is a fascinating tale of reincarnation, of the fight between good and evil across time. This makes for compelling reading, a story that draws you into its clutches and keeps you reading until the end. The characters were utterly believable and very likable, with detailed stories spanning time and incarnation. It appears to be a mixture of the future meeting history in a wonderful clash, with a great plot that moves swiftly and solidly towards an ending that is clearly a lead-in to book 2 in the series. This is a simple story yet complex at the same time with a steady plot and rising tension throughout. It’s the story of three children, born into one culture, three children who choose different paths and meet up time and time again. With each new rebirth, the same characters are recreated into new characters who maintain shreds of their original. Fascinating story; enthralling, detailed and quite simply not one you will put down once you start it. In The Emissary by Tamara Veitch and Rene DeFazio, we meet Marcus who carries the memories of other lives he has lived across long millennia. While carrying out his mission of maintaining light in the world, Marcus seeks to be reunited with Theron, who has no memories of her past lives yet is a close friend from childhood and the great love of his life. Another childhood friend, Helghul, is determined to defeat Marcus’s mission and is pitted against him and the other emissaries, fighting to quench the world’s light and bring an age of darkness. Helghul is urged on and possessed by Dark Elder, an evil personality from an even earlier age in the vast history of Earth. Ultimately, will Marcus ever be reunited with Theron, or will he be defeated by Helghul and lose Theron forever? The Emissary is a complex, layered tale spanning 26,000 years. Tamara Veitch and Rene DeFazio have written a story that is a quest, a romance, a mystery, and an epic battle between light and darkness, and ultimately good and evil. Beyond the main characters, who appear in various incarnations, this book has an array of other interesting characters, both on and off stage, who support and carry the story forward. The authors have created a richly detailed universe that is original and peopled with characters who seem as real as anyone from our world. This is a well-written book, and a part of its charm lies in the intricate designs included at the beginning of each chapter. We learn at the end of the book that it is the first installment in a series, in which we will gladly want to invest our time.